Two and a half hours of Hendrix heaven. Absolutely awesome. A.Y.E.? lit up a gloomy, damp Derby night with an amazing, pyrotech-tastic tribute to 60’s/70’s psychedelia. Wild thing drummer Kevin O’Grady and moodily statuesque bassist Mark Arnold provided the perfect wall of sound backdrop for guitarist John Campbell to producea phenomenal performance truly worthy of the great Jimi himself. Campbell dressed like, looked like, sang like and played like Hendrix. Look away and listen. It was Jimi. Look up through the swirling fog of cigarette smoke. Jimi was there. From the first note, Are You Experienced ? had the crowd happily head banging as they hammered out what seemed to be the complete works of the most inventive, iconoclastic guitarist the world has ever known. The staccato chewing, the flamboyant gestures, playing behind the head\with his teeth , the fleet-fingered fret-work on his signature Fender Stratocaster . John Campbell had ‘em all and did ‘em all. Soft, lilting Little Wing and Wind Cries Mary dovetailed with ear-numbing, axe- attacking, face-contorting versions of such classics as ‘Voodoo Chile, Purple Haze’ and a Gatling ‘ Machine Gun’ dedicated, tongue in cheek, to George Bush. Request time ! and the boys blasted out for me a storming version of the special one’s ‘Fire’ which near took the roof and rafters off of the building. 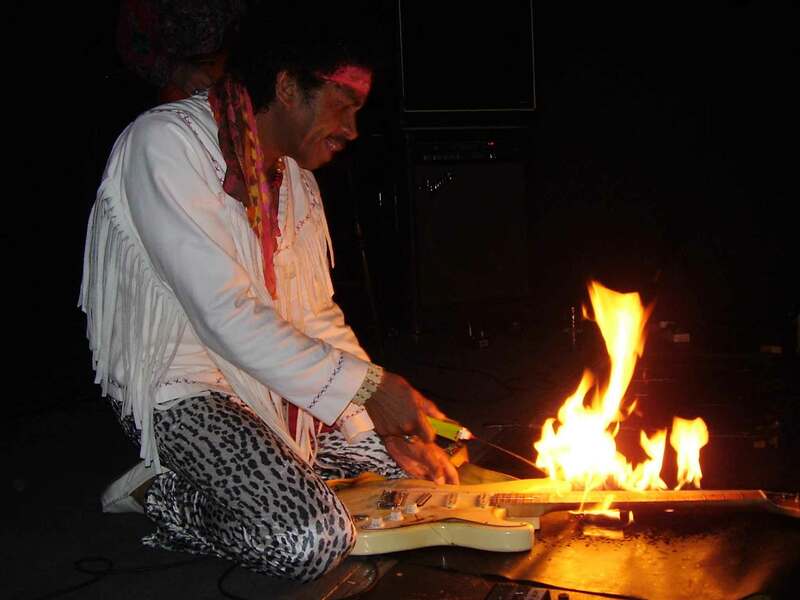 Finishing the set with a touchingly respectful, blazing lighter-fluid flourish and ceremonial burning of his white Strat., John and co. exited the stage leaving the whooping and a’ hollerin’ Flowerpot faithful in an exhausted afterglow of musical nostalgia.